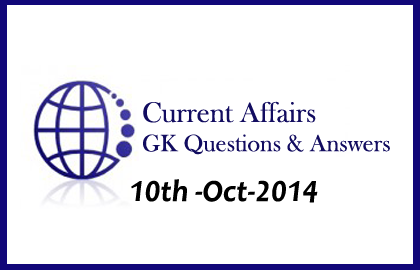 Current affairs and GK questions about the country and world are listed here. Candidates those who are preparing for IBPS PO exam and all other Banking exams can use these questions. 1).India is planning mutual cooperation in pilgrimage tourism with which country? 2).Which of the following state is working to secure World Bank funds for the state’s Buddhist Circuit? 3).55th Subroto Cup football tournament for women under 17 titles was won by which state? 4).What is the theme of International Day of the Girl Child 2014? 5).To suggests ways to decongest the roads of New Delhi, how many members committee has been formed? 6).Under Saansad Adarsh Gram Yojana, every MP will take responsibility to develop physical and institutional infrastructure in three village with in? 7).Which of the following company has won 3200 cr rupees tax dispute case in India? 8).What is the name of the pro-democracy protest that held in Hong Kong? 9).International Day of the Girl Child is observed on? 10).Indian has signed a financial partnership with______ to strengthen links between the financial services industries?